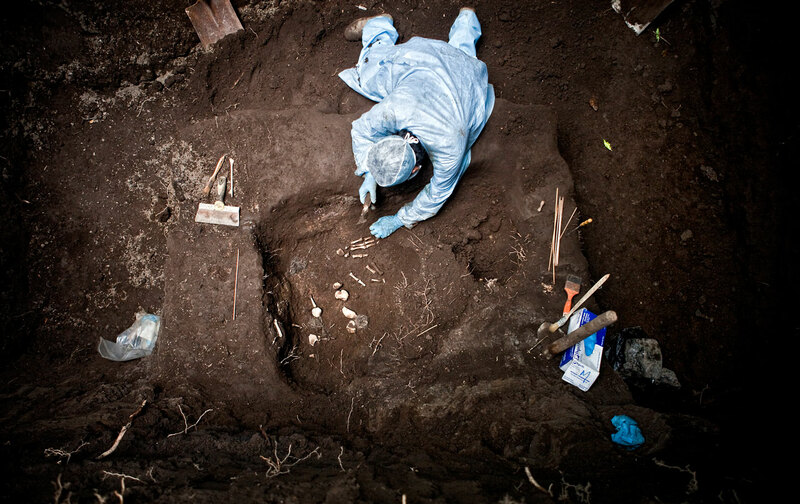 The country’s lone forensic investigator faces a system designed to keep the bodies buried. There are bodies down there. Not prosecutors, not gang members, not journalists, not policemen, not even the government doubts that in this exact spot, deep below ground level, there are bodies. And now that everybody knows, the question remains: What do we do? This is the story of a well—and of the country that surrounds it. This article is adapted from chapter six of Martínez’s latest book, A History of Violence: Living and Dying in Central America (Verso), translated by Daniela Maria Ugaz and John Washington. At the bottom of the well there are bodies. Maybe 10, maybe 12, maybe as many as 20. Definitely there are at least four. Entering into the small city of Turín in western El Salvador, if you continue on the dirt road, cross the train tracks, pass by the mud house, and keep going through the cornfield, you’ll come to the well. At the bottom of the well, there are bodies. A man straps himself into a harness. He anchors a rope to a tree, hangs an oxygen tank on his back, and takes up his flashlight. Then he drops down into the well. Darkness envelops him. He descends. Ten meters. Twenty meters. Thirty. The well is deeper than he thought. He figured it would be about 30 meters deep, about the depth of another well in the area he dove into a few months back. Forty meters. Fifty. Fifty-five, and then the man touches water at the bottom. He turns on his light. He sees socks, clothes, junk, a collection of bones, feet, toes. He gives the signal to come back up. The well is too old and seems too fragile to do any straight-down pick-and-shovel excavating. But it’s clear now: There are bodies in the bottom of the well. The man’s name is Israel Ticas, and he’s the only working forensic investigator in the entire country, as well as the only person to descend into the well. There is nobody else but him in the entire country working to dig up graves, uncover bodies, and send the evidence to the courts. In November 2010, testimonies from two gang members came together to tell a single story about the well. One of the members was from the Hollywood Locos Salvatrucha clique. The other was from the Parvis Locos Salvatrucha. They were both part of the Mara Salvatrucha in the state of Ahuachapán. Both of the men turned against their own gangs. Neither of them have ever been to the United States, which means they wouldn’t know where to find Hollywood Boulevard or Park View Street (bordering Los Angeles’s MacArthur Park), which gave the cliques their names. Both of the young men are from outside of Turín, from the hills, the countryside. Both of their testimonies coincided exactly: Turning off the highway into Turín, following the dirt road, crossing over the train tracks, passing by the mud shack, and then turning left on the next dirt path you come to, which is just wide enough for a car, and driving on past the cornfield, there you will see a field open up before you, where there is a jocote tree, a rudimentary sink, and a well. At the bottom of this well, there are bodies. In early December 2010, investigators came to Turín for the first time. That was when Ticas dropped down into the well to confirm the testimonies of the young men, knowing that at the bottom he would uncover his greatest challenge since he began his work of digging up mass graves. Excavate at a 45-degree angle. That’s Ticas’s Plan A. They’ll have to dig for the bodies; they can’t just pull them up. And instead of digging straight down, they’ll have to open up a 30-yard-wide hole 100 yards from the well and then shoot at a 45-degree angle to the bottom, aiming straight for the bodies. Once the tunnel hits the wall of the well, they’ll knock a hole through to gain access to the cadavers and drag out everything they find. The Ministry of Public Works (MOP) loans Ticas the necessary equipment: a backhoe and a couple of dump trucks. Today is the first day of digging. Bad news. Two cold fronts in a row set off a series of disasters, mostly in the interior of the country. The MOP needs its machines back. Ticas is left without help. In the first 24 days of digging, he was able to descend 10 of the 55 meters. He was happy. At that pace, he would finish digging before the wet season, which is the worst time to dig up bodies in El Salvador. In the wet season, when you dig, the rain fills back in. You empty, the rain floods. Even reinforcing the walls of your holes won’t keep the rain out. Without a backhoe or a digger, it’s going to be impossible. The MOP said they only needed their machines for a few days, to do some damage control and reconstruction, and then they’d send them back to Turín. The MOP doesn’t give the machines back. The 10 meters of progress remain only 10 meters. A single policeman keeps guard over a hole nobody is bothering with. For nine months, the guard moves himself in and out of the shade, standing watch. Ticas goes to the prosecutor of Ahuachapán, who tries to convince the minister of defense to loan out some new equipment, but nothing happens. The wooden cap to the well is replaced by a cement seal. Ticas tries advertising on his Facebook account: looking for a backhoe, a dump truck, anything to help him dig some dead bodies out of a well in Turín. He’d be grateful for the hand. El Niño Hollywood, of the Hollywood Locos Salvatrucha clique, is one of the witnesses whose testimony led Ticas to the well. The 30-year-old loves to talk. He even likes to talk with prosecutors, though when he does so, he cuts down on his colorful adjectives and skips over the guts and the gore. He likes it when prosecutors bring him other ex–gang members and they sit down and talk about comrades who died in the war against Barrio 18. He tries to impress people with his memory, his ability to read people and interpret candle flames, his knowledge of witchcraft. He’s been living in a shack down the street from the police station in El Refugio since 2009, and he’s the key witness in the case against his boss, Chepe Furia. Today is the first day a journalist visits his little shack, and El Niño settles into his role as storyteller. We talk for three hours. El Niño tells me how he joined the MS in ’94, and then he tells me how many murders he’s committed, how many murders he’s witnessed, and how many he’s heard about. He talks about drugs, extortion, death threats, traitors, corrupt cops, and friendly judges. He tells me how a traitor can destroy an entire clique. He tells me how his own gang killed his brother. Another clique within the MS thought his brother, known as El Cheje, was a traitor. So they killed him. And then the murderers tried to kill El Niño so they wouldn’t leave an enraged hit man on the loose. They tried to take him for a walk (and this is the most important phrase, taking someone for a walk, in his story), but it ended up being El Niño who took them for a walk instead. When a gang member takes you for a walk, they trick you into accompanying them to some place where they kill you. Let’s go grab a drink. Let’s go visit that place. Let’s go kill what’s-his-name. That’s when they pull the gun on you. Let’s go smoke a jay by the well in Turín. He starts telling me about clique exchanges. When a gang member is hunted by the police in the clique’s territory, he gets shipped out to a clique in another territory to work there for a while. That’s where he chills, El Niño explains. There are an estimated 25,000 gang members in El Salvador, with another 9,000 in prison as of 2011. He tells me that his clique worked exchanges with other cliques, and that he himself would get moved to San Salvador sometimes, to chill, but that members who would get sent over to Hollywood territory didn’t necessarily need to chill. Rather, they came because that’s where the wells were. He sits down next to the well, looking at his hole, the cadavers deep below him. For the past month, Ticas has had a backhoe at his disposal. The Engineers Command of the Armed Forces—the only agency that has paid any attention to the Ahuachapán public prosecutors—loaned him the backhoe. But it doesn’t do a thing for him if he doesn’t have a couple of dump trucks to go with it. A single backhoe, scooping up one scoop, climbing out of the hole, driving 100 yards and then getting back in the hole, over and over again, isn’t worth the time or the gas. It’s worth remembering one other detail. A year ago, in January of 2011, Ticas had everything he needed, and in just 24 days he was able to dig down 10 yards. As the well is 55 meters deep, if he had been able to keep digging at that same pace, he would have dug down to the bodies 10 months ago. “You seen the sink that’s close to that well?” El Niño asks me from his little backyard garden. He’s inspecting the radishes he’s growing. I have seen it. Someone had installed a basic sink, probably to carry water from the well where they could wash clothes under the jocote tree. That sink is the setting for El Niño’s story, the story of a murder, the story of how every murder story in this country has a backstory. This backstory, however, is difficult to describe: In the gang war, if you’re not in the middle of it, a lot of it doesn’t seem to make sense. An example: Members of El Niño’s clique once killed an aspiring member because instead of saying he was pedo, or high, after smoking marijuana, he said that he was peda, the feminine version of the same word. The clique took the mistake as a terrible offense because everything they do is masculine and everything the enemy does is feminine. So they killed him, stabbed him to death on the spot. It’s hard to understand. Wells don’t get filled up with bodies killed for strategic reasons; there isn’t even criminal logic to many of the murders in this country. There are bones in the bottom of wells for one simple reason: animal violence. Can I kill? Yes. Can I hide the body? Yes. Will it be hard for authorities to find the body? Yes. Will I be looked on by fellow gang members as courageous? Yes. Thus, I kill. And after a few kills, I get used to killing. Killing becomes part of everyday life. Thus, little by little, wells get filled. The body of Ronal is one of the four being looked for by state prosecutors, thanks to the testimony of El Niño. For those four bodies, prosecutors brought charges against 43 members of three different cliques who had been caught after a series of interrogations. All 43 were arrested in October 2010, which means that by October 2012, if nobody pulls the bodies out of the well, all the detained men, having served the maximum amount of time in jail without being sentenced, will be released. But it’s not just those four bodies. Prosecutors expect to turn up many more. They’ve received information that the well was used as a body dump by various cliques: Los Angeles, Parvis, Hollywood, Acajutlas, Pride Gangsters, and Fulton. Ticas is in a good mood. He’s been up and down, but now he feels good. At the beginning of April, he convinced the MOP to give him back the backhoe, the two trucks, and the dump truck. At the end of April, however, they took back all the trucks. All he had left was the backhoe—useless on its own. But then, just a week ago, a surprise: Rumbling past the cornfield one day are three trucks, a dump truck, and a bulldozer. The Army and the MOP teamed up to find him what he needed. The wet season is still thrusting its head about, but Ticas is optimistic. Every hour, one person is murdered in El Salvador; 6,657 people were murdered there in 2015, up 70% from 2014. The well is becoming a metaphor for the country: The deeper you dig, the worse things get. The longer you wait to solve a problem, the worse the problem becomes. The well has flooded. The rains came and flooded everything. When it was all ready to go, only 18 more meters left to dig of “the damn well,” as Ticas now refers to it, it flooded. The rains fucked up the good summer stats, too. With consistent showers over three months, Ticas only dug 27 yards. Thirty-seven in total. This is what happens when you let a problem fester: The solution doesn’t stay the same. He has all the tools that he needed before. But now he needs a new tool: something to pump out the water. Ticas is working other cases now. Other cadavers. He’s dug up a few young men from Soyapango, in the middle of the country, a few women from Santa Ana in the west. Meanwhile, the rains are soaking everything in Turín. It’s impossible to dig. The pump came in too late. Everybody is asking for their machines back. The backhoe, the dump trucks—they’re all returned. All work at the well in Turín has come to a standstill. Nobody is digging up the dead. Six of the gangsters, after being locked up for two years waiting for something that would never happen, are due to be released. Ticas, once again, is frustrated. El Salvador received 39 out of 100 points on Transparency International’s 2015 index, indicating serious corruption. Then he repeats that he would have liked to have dug it all himself with a pick and a shovel. Maybe he’s hit on something: That’s who we are as a country, a man with a pick and a shovel trying to dig up our dead, and yet unable to dig deep enough to save them. The regional chief of the attorney general’s office, Mario Jacobo, confirms that representatives of the state asked for provisional dismissal of charges for those accused of dumping the bodies into the well. He says it’s a strategy in order to get another year to keep digging, that they’ve been able to pin two of the bodies on the six gangsters about to be released, and that they’re positive there are at least five bodies in the well, if not many more. He hopes that by the end of this month, they will get to the “exact point where forensic investigator Ticas wants to be.” After over a year of work, he would have been able to add. The media latches back onto the story with headlines like 20 Bodies Found in Turín Well and Our Bottomless Well. Articles describe a change that people have been unable to explain: The depth of the well isn’t the same as it used to be; it is now only 42 meters deep. Water has been leaking in from somewhere. Maybe the digging cracked into a new vein of groundwater. Whatever happened, Ticas is now only five meters from reaching the supposed bottom. El Niño gave testimony yesterday against 19 members of the Hollywood Locos Salvatrucha clique for committing acts of murder, though none of it relates to the well. Prosecutors claim all that’s left is to get to the bottom of the well and determine a court date for the accused, but nobody knows if they will still be in custody at that point, after two and a half years in prison and still without being taken to court. El Niño says he’s tired of going to court and talking so much. Ticas is only four meters from the bottom, four meters away from digging down 42 meters to the bottom. Almost there, he feels a new fear: that he himself will die inside the well. The digging isn’t dry anymore. It’s more like digging through a muddy swamp. It’s not raining, but water is coming up from below. A subterranean seep, leaking from the walls, bursting with every scoop of the shovel. Despite the danger, and the fear, Ticas is also thrilled, seeing light in the damp darkness. This is Plan B. Or maybe it’s actually Plan C. Or maybe even Plan Z. It’s all that’s left for him. From the wall of dirt directly in front of Ticas to the well shaft where the bodies are, there are eight more meters. Eight meters straight ahead. Ticas now wants to start digging from above again, from about 30 meters down, digging a five-meter-wide hole heading diagonally into the well shaft. Then, once the prosecutors find him scuba gear, he can drop right into the dark swamp at the bottom of the well, right into that soup of earth and bones. He still hasn’t reached the bottom. Today marks 805 days since authorities discovered bodies in the well. Twenty-eight months. This is what we know: At the bottom of the well, there are bodies. Maybe 10, maybe 12, maybe as many as 20. But definitely there are at least four. Entering into the small city of Turín in western El Salvador, if you continue on past the dirt road, cross the train tracks, pass the mud house, and continue on through the cornfield, you’ll come to an open field with a jocote tree, and next to the tree is the well. At the bottom of the well, there are bodies. This is all we know. Óscar MartínezÓscar Martínez writes for ElFaro.net, the first online newspaper in Latin America. He is the author of A History of Violence and The Beast, both published by Verso.